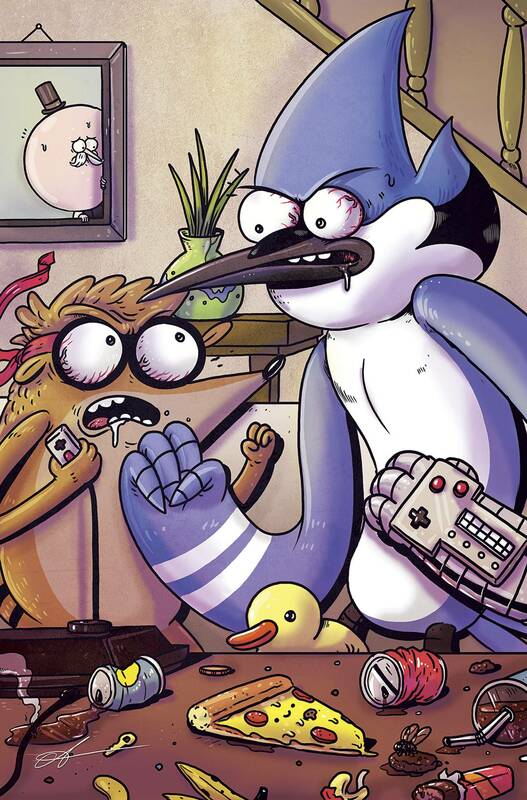 Mordecai, Rigby, Skips, Benson, and all your favorites from the hit Cartoon Network series embark on a series of adventures in this very special anthology issue of Regular Show. Features work from The New York Times best-selling writer Derek Fridolfs (Study Hall of Justice), Hannah Blumenreich (Spidey Zine), and a series of new groundbreaking storytellers! Rigby attempts to make dinner for a date night with Eileen, Rigby is caught lying about his birthday to get free cake all year, Mordecai agrees to be Rigby's roller-skating coach, and Muscle Man accidentally summons the Four (Mini-Bikers of the Apocalypse in new stories!